Am heutigen Montag zieht ein kräftiger Sturm, benannt “Bennet”, einmal quer über Deutschland und bringt verbreitet schwere Sturmböen um oder über 90 km/h. Im Wesentlichen ist unsere gestrige Vorhersage noch korrekt, also bitte einmal HIER nachlesen. Entlang und vor allem Rückseitig der Kaltfront, die sich im Laufe des Tages von West nach Ost über Deutschland bewegt, ist mit schweren Sturmböen zu rechnen. Im Grunde genommen ist ein solcher Wintersturm nichts außergewöhnliches, allerdings bedarf eine derartige Wettersituation immer erhöhter Vorsicht und Aufmerksamkeit. Was heute allerdings besonders ist: es ist gleichzeitig Rosenmontag, und so werden viele Leute bei Umzügen auf der Straße sein. Somit ist erhöhtes Potential für eventuelle Unfälle gegeben. Seien Sie allenfalls vorsichtig und achten Sie auf das Wetter; setzen Sie sich nicht leicht vermeidbaren Gefahren aus. Today, a strong storm by the name of Bennet will pass over Germany, bringing widespread severe storm gusts of 90 km/h and above. Overall, yesterday’s forecast is still correct, so go have a read of that HERE. Along and especially behind the cold front, which will move from west to east across the country, severe storm gusts are to be expected. In general, a winter storm like this is nothing out of the ordinary, though heightened caution and awareness is always advised in a situation like this. What is different today is that at the same time, it is shrove Monday, so there will be many people attending parades out in the open. Therefore, a heightened potential for accidents is given. No matter what you are doing today, be cautious and keep an eye on the weather; don’t expose yourself to easily avoidable risks. This entry was posted in Uncategorized on March 4, 2019 by Linus Höller. An und hinter der Kaltfront des Sturmtiefs “Bennet”, dessen Kern sich morgen im Laufe des Tages von den Britischen Inseln kommend über die Nordsee schließlich in die Ostsee verlagert, sind schwere Sturmböen zu rechnen. Schon seit einigen Tagen rechnen alle Wettermodelle mit vergleichsweise kleinen Unterschieden mit diesem Sturm, der das gesamte Bundesgebiet Deutschlands betreffen wird. Oben haben wir die vorhergesagte Wetterlage für Montag, 12UTC (also 13:00 Ortszeit). Man beachte das Tief mit Kern in der Nordsee. Der Prognostizierte Kerndruck liegt bei 975hPa. Von dem Tief erstreckt sich eine Kaltfront über Deutschland, die Alpen, Südfrankreich bis nach Spanien und Portugal. Besonders entlang dieser Kaltfront, die sich (in Richtung der Dreiecke) im Wesentlichen von West nach Ost über Deutschland bewegen wird, sowie hinter ihr, ist mit den stärksten Sturmböen zu rechnen. 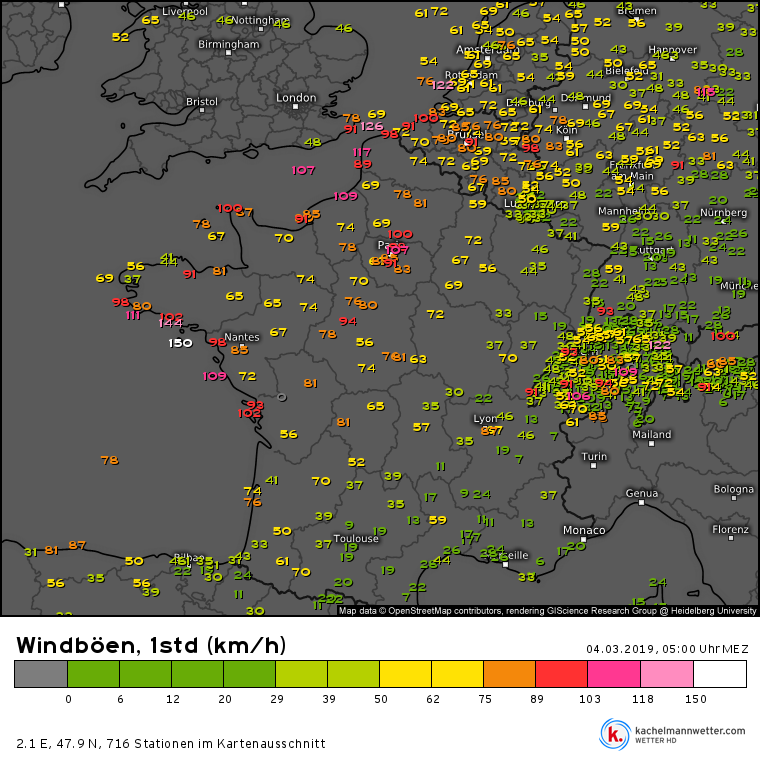 Generell gilt auf einer Wetterkarte: Je näher die Isobaren (also die Linien gleichen Luftdrucks) zusammenliegen, desto stärker der Wind. Besonders im Norden Deutschlands können sich sogar einzelne Gewitter bilden. Diese bergen dann die Gefahr in sich, noch deutlich stärkere Böen die eventuell auch Orkanstärke erreichen könnten (d.h. über 120 km/h) mit sich zu bringen. 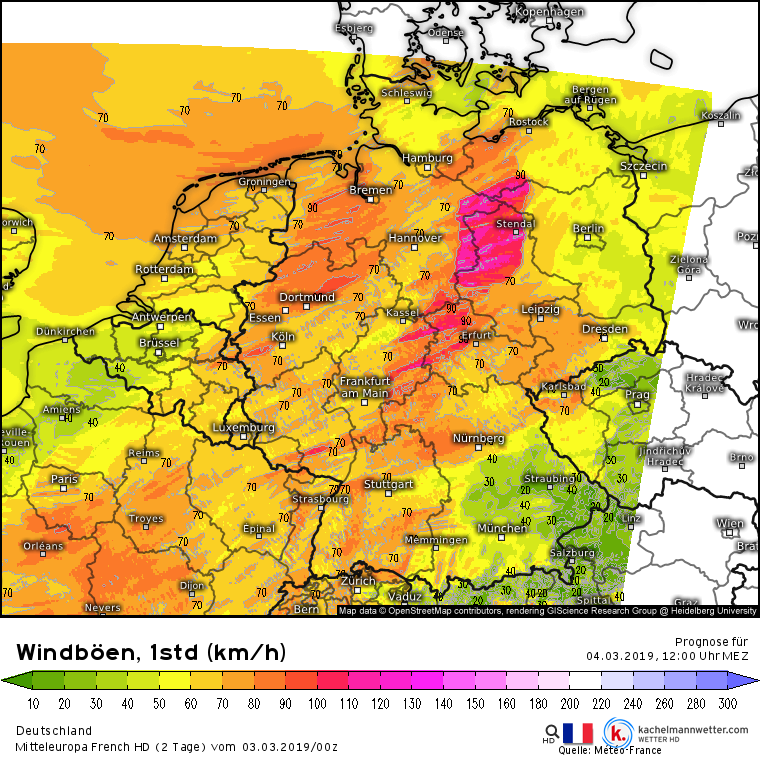 Das Vorhersagemodell von Meteo-France rechnet zwar im Allgemeinen mit einem weniger starken Sturm als die sonstigen Vorhersagen, allerdings erwartet es auch eben die vorhergenannte “Squall-Line” (Böenfront) im Norden Deutschlands, und rechnet innerhalb dieser sogar mit Böen von bis zu 140 km/h. Zwar besteht die Möglichkeit dafür, da allerdings die restlichen Vorhersagemodelle mit einer nicht ganz so extremen Ausprägung rechnen, ist aber relativ unwahrscheinlich. 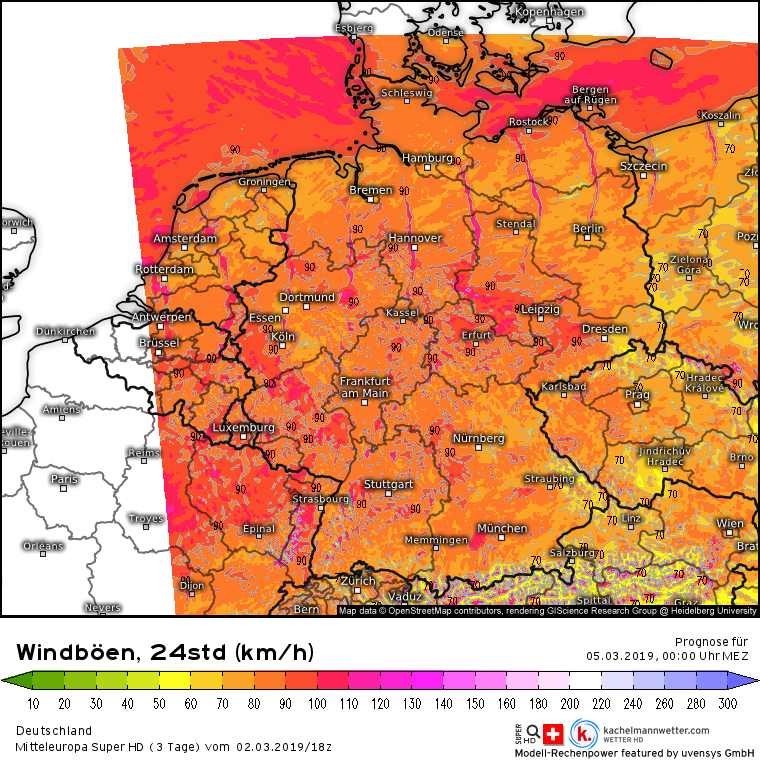 Die Karte oben zeigt die höchsten Windgeschwindigkeiten an, mit denen dieses Modell von Kachelmannwetter im Laufe des gesamten Tages rechnet. Man sieht, dass insgesamt fast überall mit Sturmböen oder auch schweren Sturmböen von um oder auch über 90km/h zu rechnen ist. Evtl. kann es auf den Berggipfeln, an den Küsten und an sonstigen exponierten Orten auch noch etwas darüber kommen. Außerdem sollte man die mögliche Böenfront im Norden Deutschlands im Auge behalten, entlang der es – vor allem in Kombination mit eventuell auftretenden Gewittern – doch noch etwas happiger kommen kann. 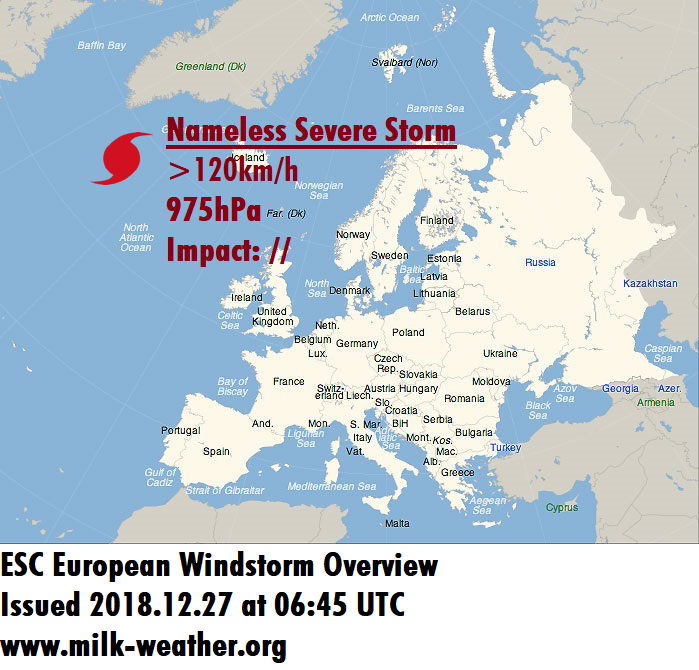 Along and behind the cold front of a storm by the namet of “Bennet”, which will move from the British Isles by way of the North Sea and into the Baltic Sea over the course of the day tomorrow, severe storm gusts are to be expected. Forecast models have been expecting this storm for several days and with relatively small discrepancies between them, and expect it to affect all of Germany. Above, you can find the predicted atmospheric conditions for Monday, 12UTC (so 13:00 local time). 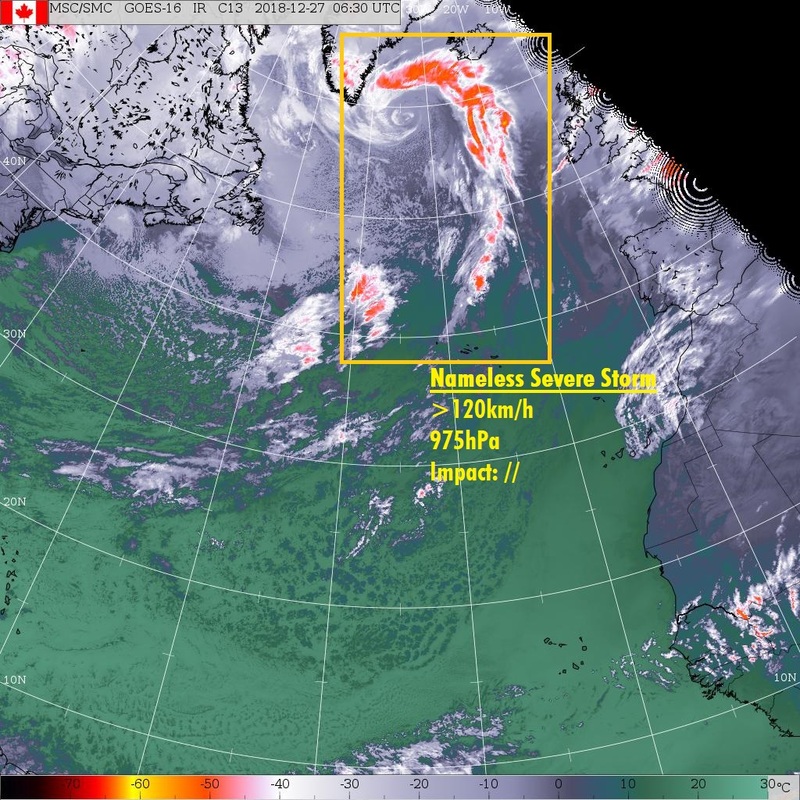 Note the low pressure area, the center of which is located in the North Sea with a predicted pressure of 975 hPa. Coming from the low, a cold front extends across Germany, the Alps, southern France and all the way to Spain and Portugal. It will progress in direction of the triangles, so largely from west to east across Germany. Along as well as behind this front is where the strongest storm gusts are to be expected. A general rule for weather maps is: the closer together the isobars (lines of equal pressure) are, the windier the conditions. Especially in the north of Germany, some thunderstorms may form, too. These carry the risk of bringing even stronger storm gusts within them and in their vicinity. These gusts may reach hurricane force, so exceed 120 km/h. The forecast model by Meteo-France expects a weaker storm in much of Germany than most of the other forecasts, however it is also predicting the aforementioned squall line in the north of the country, and expects it to bring wind speeds of up to 140 km/h. Though the possibility of this taking place cannot be ruled out, the other forecast models don’t expect quite as extreme wind speeds, and therefore, it seems unlikely that the squall line should reach such an intensity. The above map shows the highest wind speeds that this weather model by Kachelmannwetter expects over the course of the entire day. You can see that almost everywhere, storm gusts or severe storm gusts of around but also above 90 km/h are expected. Coasts, mountain peaks and other exposed areas may experience even higher wind speeds. Furthermore, one should keep an eye on the potential squall line in Norther Germany, which – especially in combination with possible thunderstorms – might pose a particular risk to life and property. This entry was posted in Uncategorized on March 3, 2019 by Linus Höller. 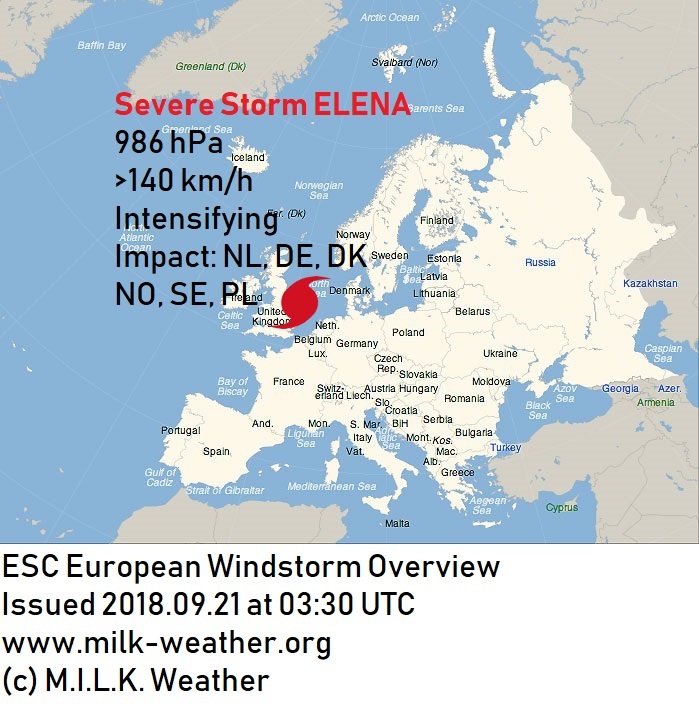 Storm ELENA, which has crossed the UK in the night from Thursday to Friday and its currently making its way into the North Sea, will bring a good deal of wind to northern central Europe today. The storm currently has a central pressure of 986 hPa and packs wind speeds of over 140km/h, however is expected to further intensify, eventually reaching peak gusts of up to 190km/h in its center. 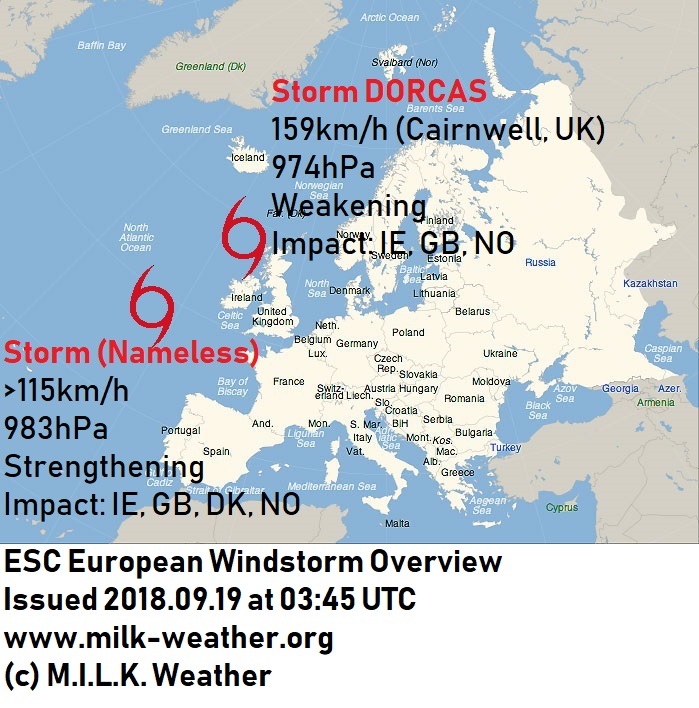 Denmark will likely be the hardest hit in terms of wind speeds; especially in exposed locations and at the northwestern coast, peak gusts may reach full hurricane-force, possibly exceeding 160km/h. 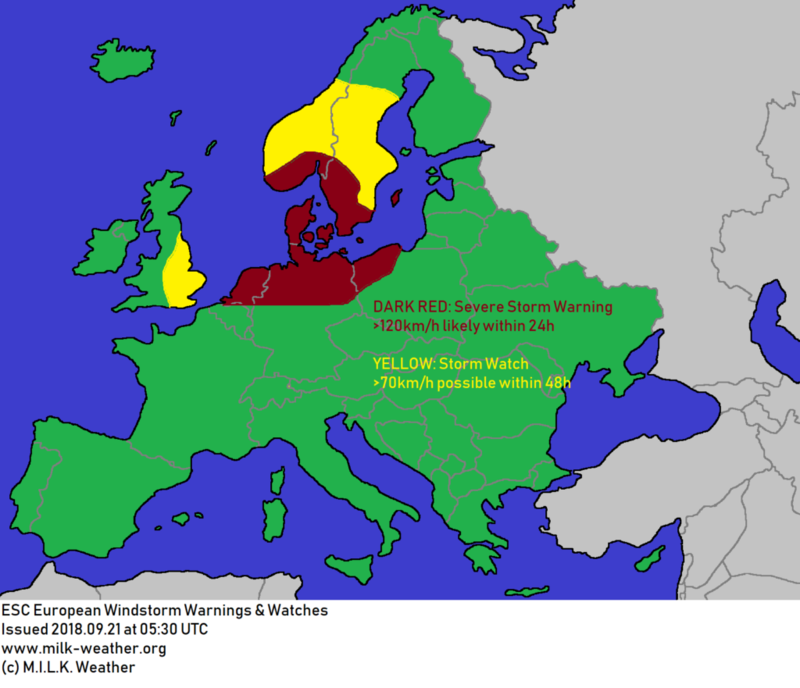 The Netherlands should expect stormy conditions to commence within the next few hours, bringing wind speeds of 70-100km/h to much of the country and peaks of up to around 120km/h at the coasts. In Germany, the North Sea coast and its islands should brace themselves for storm gusts in the range of 100 to 120km/h. 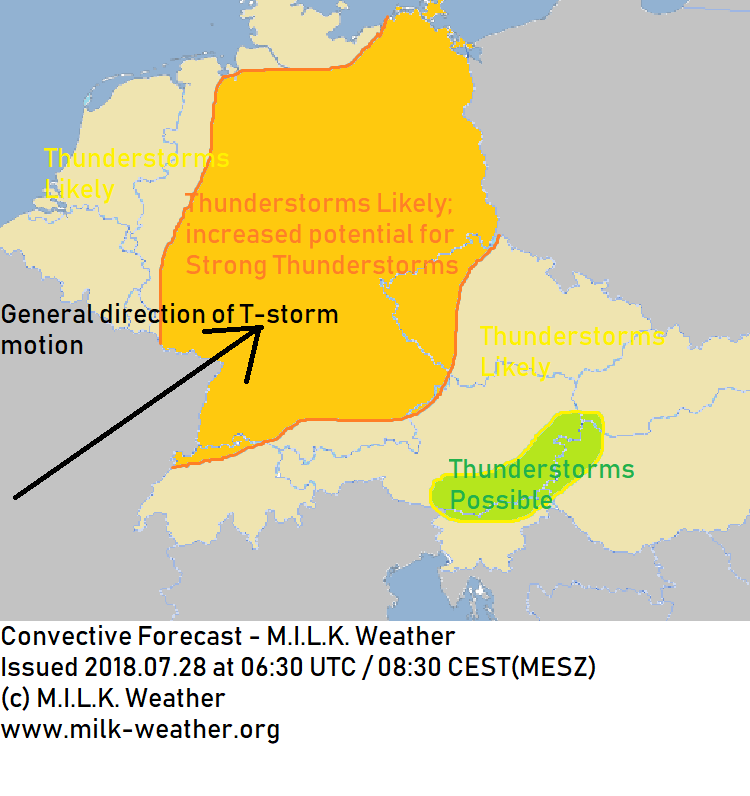 Further inland, a strong cold front will move from west to east over the north of Germany, bringing not only a drop in temperatures by up to 20°C in very short time, but also potentially hazardous storm gusts which may locally exceed 100km/h. This same cold front will move into Poland, affected especially the west and northwest of the country before it lessens in intensity overnight. In Sweden and Norway, storm gusts are mainly expected at the southern coasts and in exposed locations such as mountain peaks, however there are uncertainties in the forecast and how far north the wind field will reach. 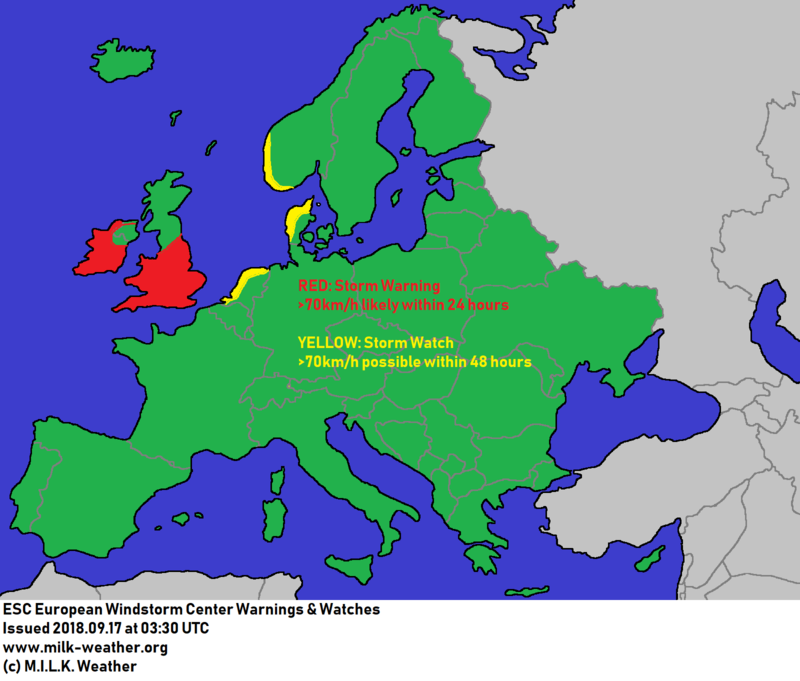 Below are the Windstorm overview and the windstorm warnings and watches for Europe. This entry was posted in Uncategorized on September 21, 2018 by Linus Höller. 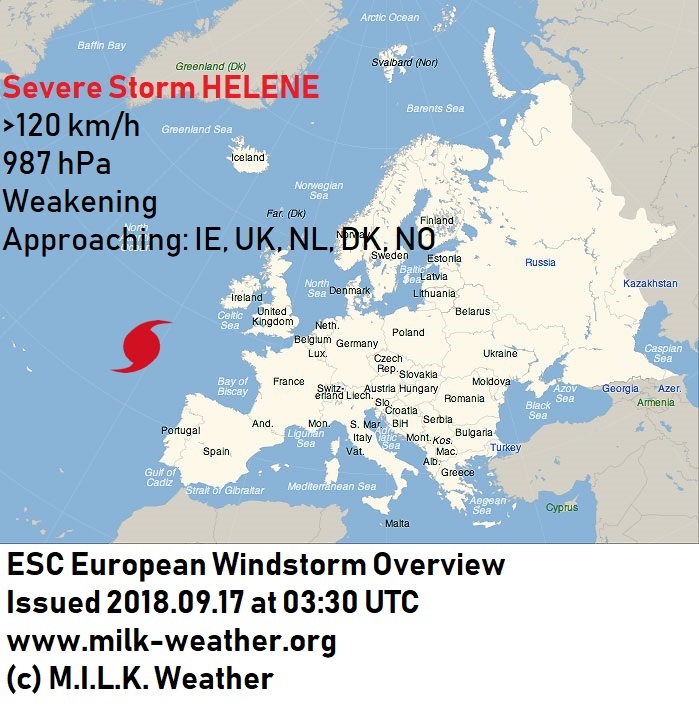 The former Hurricane “HELENE”, currently located to the southwest of Ireland with a central pressure of 987 hPa and peak wind gusts of around 120km/h, is expected to move across the British Isles today. Compared to earlier forecasts, this latest forecast run suggests that the storm will be considerably weaker and will likely pose minimal risks to the areas it crosses. Ireland will be reached first, especially the western coast; peak storm gusts may reach 90 or 100km/h. The storm field is later expected to cross the southern UK, where storm gusts should not exceed 70km/h in most places. Highest wind speeds will be observed at exposed locations and at the coast. 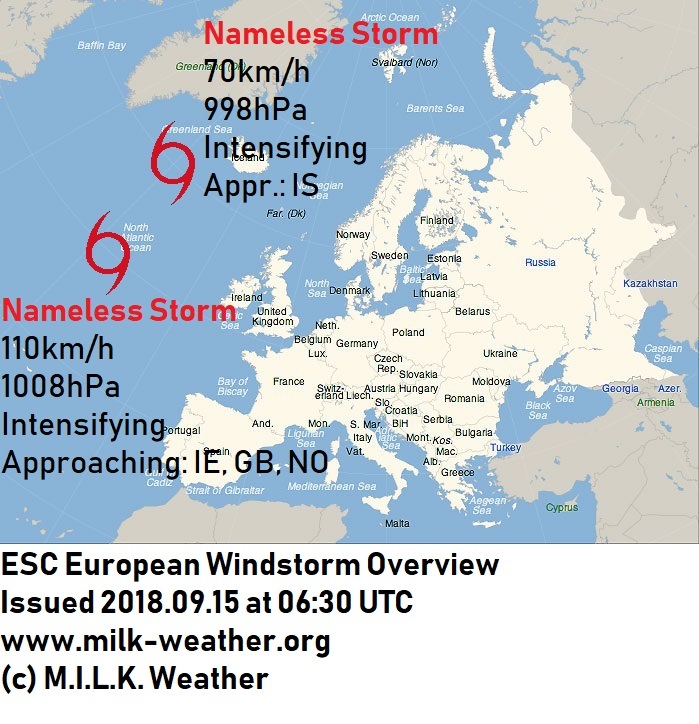 Later, the wind field of former hurricane HELENE may also stripe the coast of the Netherlands, Denmark, and Norway; however, here, too, peak gusts should not exceed about 85km/h. This entry was posted in Uncategorized on September 17, 2018 by Linus Höller. 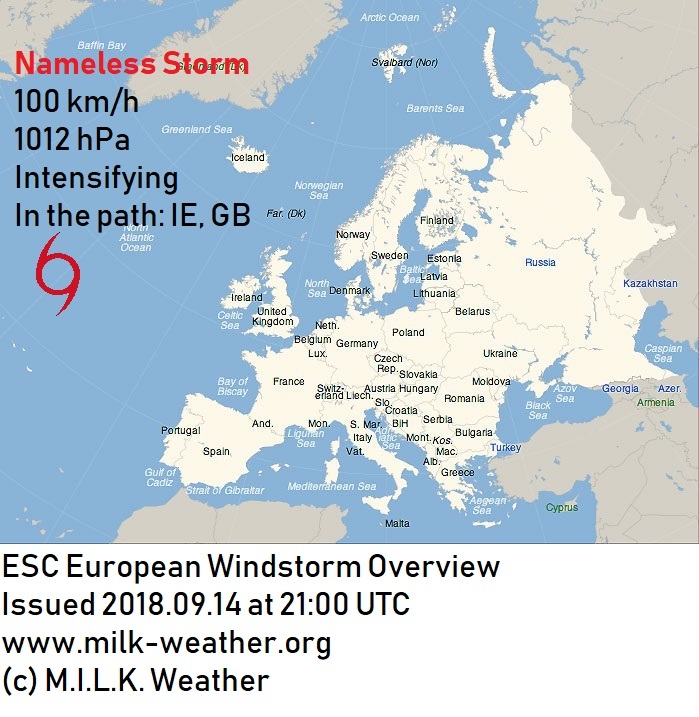 There is currently one storm system in the proximity of Europe. The unnamed storm which had a central pressure of 1012 hPa at 18:00 UTC and currently packs estimated peak gusts of around 100km/h is expected to further intensify as it moves eastwards in the next 36 hours. Ireland will be the first to be affected by the storm, with gusts of up to 110km/h possible along much of the coastline, though weaker winds are to be expected inland. The storm will continue to move northeastwards, affecting Scotland and bringing hurricane-forced gusts especially to the highlands, coasts and islands; gusts of up to 130km/h are very well possible, locally wind speeds may even exceed 130km/h. 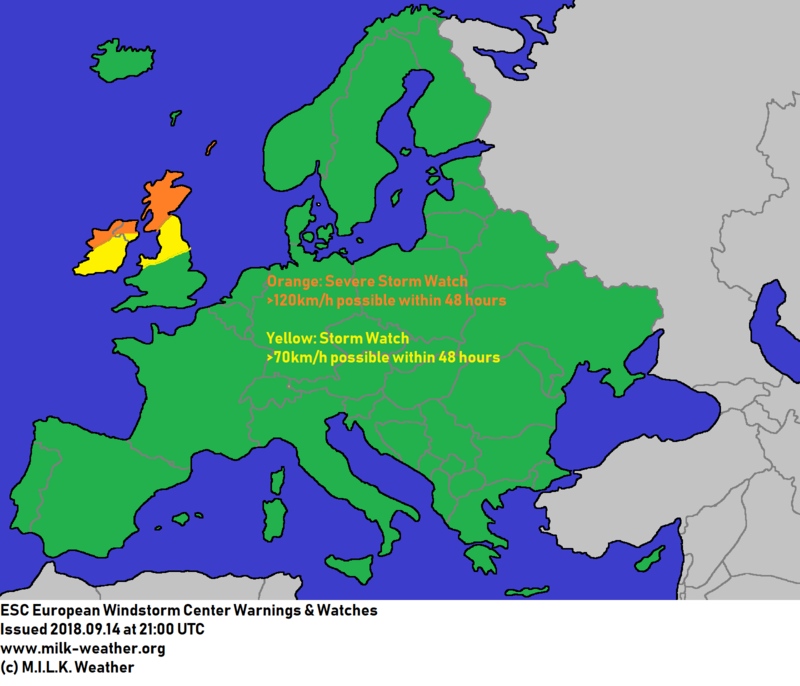 The storm is expected to continue moving northeastwards and may later affect Norway, however due to uncertainties in predictions, ESC watches are not issued more than 48 hours in advance. 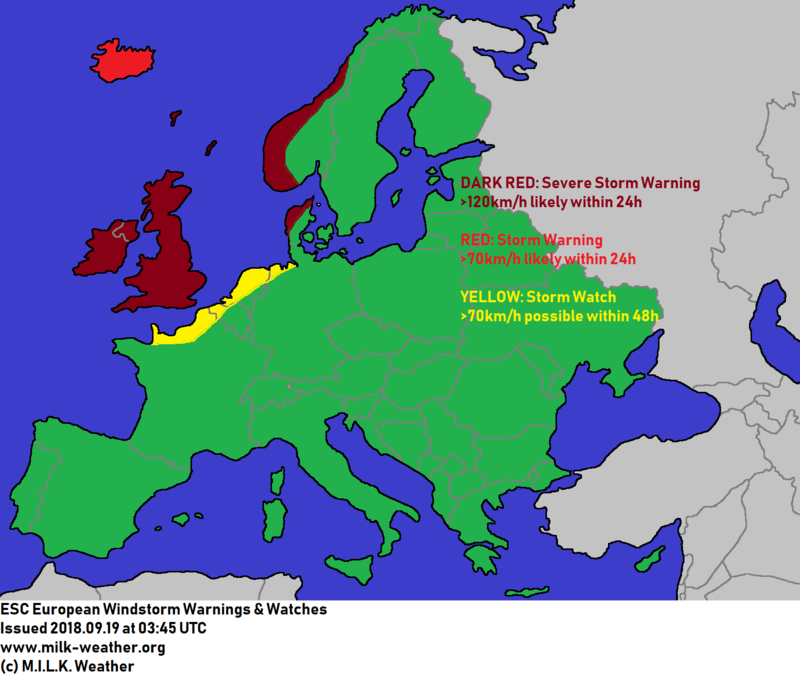 Below are the ESC overview, as well as ESC European Windstorm Warnings & Watches. This entry was posted in Uncategorized on September 14, 2018 by Linus Höller. 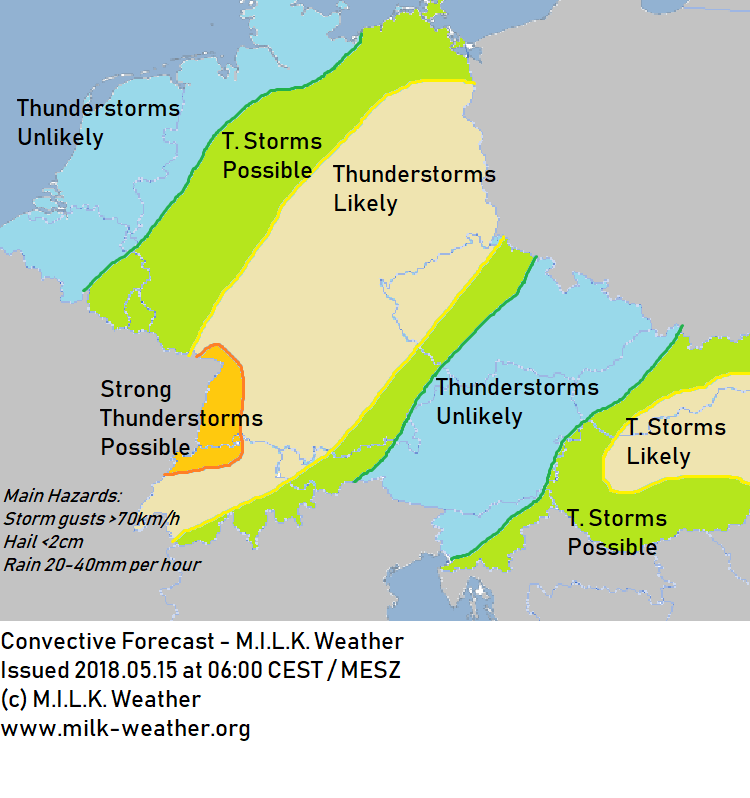 Wide parts of Germany and Central Europe present the right conditions for the formation of thunderstorms today. This is due to the unstable layering of the atmosphere which, in combination with the energy that the sun provides, will lead to the formation of local heat-induced thunderstorms in the afternoon. Most of these thunderstorms will be rather narrowly confined, meaning that if one town is hit by a thunderstorm, the neighboring town may stay entirely dry. The general direction the thunderstorms will move across Germany is from Northeast to Southwest. The main risk stemming from today’s thunderstorms is strong rain of between 20 and 40 liters per square meter in short time (under an hour). Flash flooding can take place, which can result in traffic delays and property damage. Further, in and around thunderstorms, storm gusts of up to 70km/h are possible. Also small hail, which will in the most cases not exceed a diameter of 2cm, is not to be ruled out. Hail with more than 2 or 3cm in diameter, tornadoes, as well as strong, structured thunderstorms are unlikely under today’s conditions. If possible, keep yourself informed about the current weather situation. Below, you will find the “Convective Forecast” for Central Europe. This entry was posted in Uncategorized on May 15, 2018 by Linus Höller.